Yorkshire moved three points clear at the top of the One-Day Cup North Group table by beating Northants by 164 runs. England's Joe Root made seven as the visitors stuttered to 73-4, but Gary Ballance's List A career-best 152 not out helped Yorkshire post 300-6. Northants slumped to 11-4 after only 16 balls with David Willey (2-22) and Ben Coad (2-26) doing the early damage. Azeem Rafiq took 3-27 as the hosts were all out for 136 - a result which means they cannot reach the knockout stages. 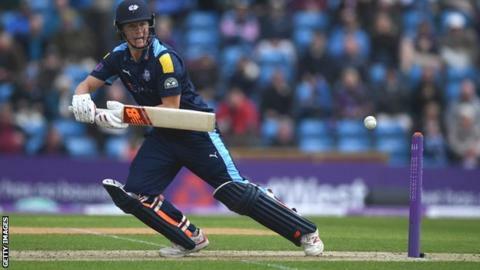 Northants, whose top scorer was Graeme White with 40, have won only once in their first five matches, while Yorkshire's position was strengthened as second-placed Worcestershire were heavily beaten by Lancashire. There was no sign of what was to come when Yorkshire lost Adam Lyth for two in the first over, soon followed by Root, before Jonny Bairstow made 39. Ballance, who shared century stands with Matthew Waite (43) and Adil Rashid (41), smashed three sixes and 19 fours in his 118-ball knock and his innings amounted for over half of Yorkshire's runs.